Words by: Michaela Acero / Photos by: Christopher Cancio and R.O.X. Wall climbing is not something that everyone considers pursuing. I personally just used to see it as a fun thing to do at cool places like cruise ships and sports clubs! 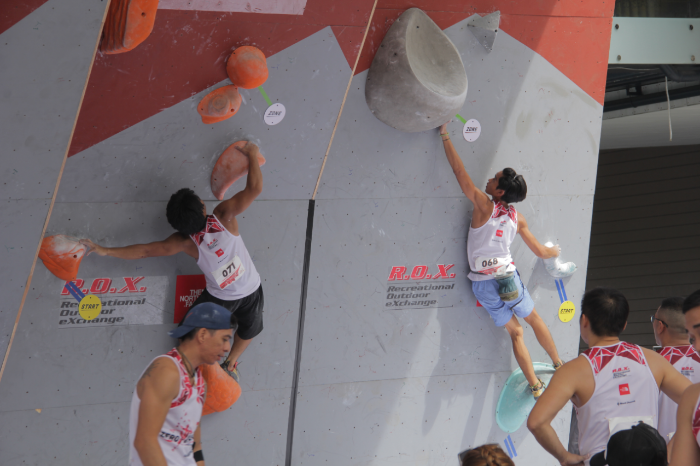 However, this reputation of wall climbing is rapidly changing with its rise in popularity in the Philippines. Did you know that we actually have a Philippine National Climbing Team that’s currently preparing for the 2020 Tokyo Summer Olympics? Keep on reading for more reasons why YOU should try wall climbing yourself! 5. It’s a full body (and mind) workout. The whole objective of wall climbing is to reach a particular mark or spot on the wall before returning to the ground. This means that your whole body will have to work to reach that goal, and your mind will be extremely active, too! Since there’s no one way to climb, your mind will have to think up various routes and moves that can help you reach your goal. 4. It is very fulfilling. There’s nothing quite as satisfying as that feeling you get when you accomplish something pretty challenging, right? Since wall climbing is all about conquering that fear of not being able to get to your destination on the wall, it can be very fulfilling to overcome the challenges that come with it. 3. It is a great stress reliever. Much like other forms of exercise, wall climbing can relieve stress, too. Members of the Philippine National Climbing Team say that training stops being a burden when it relieves whatever stress you may be carrying from work or school. Philippine National Climbing Team member, Jo Ala, talking about the benefits of climbing. 2. Wall climbing is easily accessible. Not only is it a popular sport on the rise, it’s also a sport that’s very accessible to those living in Metro Manila. You can go to R.O.X. (Recreational Outdoor eXchange) in BGC, Climb Central in Mandaluyong, and Power Up Climbing Gym in Tandang Sora, for example. 1. It’s easy to get into. The wall climbing community is very beginner-friendly. You won’t have to worry about feeling clueless because there are trainers at every climbing gym who are more than willing to help. If the reasons above still aren’t enough to get you going, there are also lots of functional AND cute sport outfits that The North Face has come up with to fulfill your indoor and outdoor climbing needs. Check out more stylish and functional equipment here! What are you waiting for? Check out a climbing gym near you and get started on this cool sport!